Byline: Brendyn Monsorate, Bilal Hafeez and Christopher Swaminathan – three people of determination who are working as part of the Special Olympics World Games Abu Dhabi 2019 press office. Dubai, UAE, 18 March 2019: Athletes from Papua New Guinea (PNG) enjoyed a clean sweep of medals at Special Olympics World Games Abu Dhabi 2019. 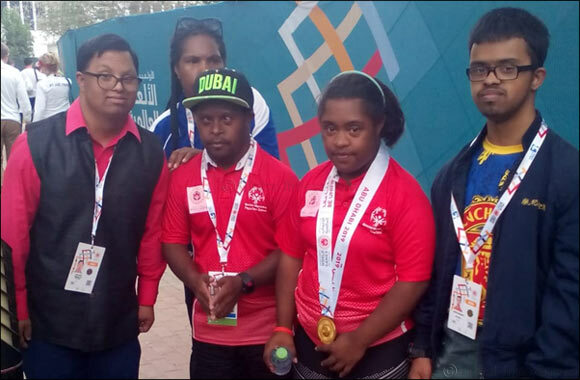 The sportsmen and women from the tiny Pacific Island nation made their presence felt after winning gold, silver and bronze in the shot-put competitions at the Dubai Police Stadium. “In order for us to participate in the World Games it took us one whole year to get ready,” said Margaret, the assistant coach. The PNG government is actively working to improve the lives of youngsters with intellectual disabilities by including them in schools and sports programs, the coach said. “Before it was not so much, but the government is now pushing them into inclusive education and inclusive sports and there is now a movement in PNG to include children of different abilities in all spheres. The coach added that the entire PNG team are savoring every moment at the World Games.